Eva is a character in the HD Universe who appears as a minor character in Grand Theft Auto V. Her voice actress in not credited. 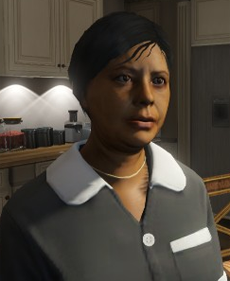 Eva, by 2013, had become the house maid for Michael, Amanda, Jimmy and Tracey De Santa in their house in Rockford Hills, Los Santos. While getting along with Michael, who praises her cleaning, she dislikes Amanda who complains and also tries on her clothing. She also dislikes that Amanda gives her a pill to clean faster, that Jimmy urinates in saucepans, that she cannot clean while people are watching her and that the De Santa's use a lot of pots for a "family that cooks in microwave". This occasionally results in Eva and Amanda arguing in the kitchen. It is suggested that she steals from the De Santa's as she admits to taking some of their possessions home to clean them while also being unable to clean while being watched. When angered Eva speaks in Spanish. This page was last modified on 2 March 2017, at 23:44.